As the largest county in North Carolina, Wake County wields considerable political influence. The 2010 census recorded Wake’s population at 900,000 residents, but that number is probably closer to 950,000 today. The county seat is Raleigh, the capital of North Carolina and the state’s second-largest city. Wake County boomed at the end of the twentieth century thanks to the influence of RTP. Many of Wake’s residents are employed in the flourishing tech industry based there. Pharmaceutical and biotechnology jobs are also abundant and an example of North Carolina’s new economy. The county is home to a number of institutions of higher education, including North Carolina State University, the largest university in North Carolina. 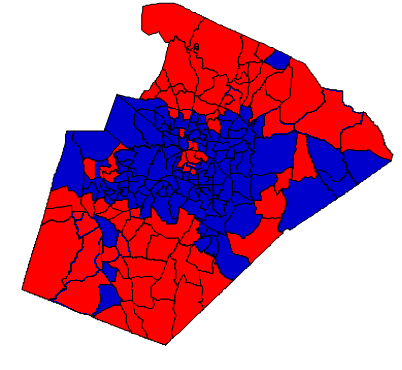 Since 2000, Wake County has been trending to the Democratic Party. This trend has been in part fueled by a massive influx of out-of-state transplants, most of whom are moderate to liberal in political orientation. Only about half the transplants in Wake County over the past decade were non-Hispanic Whites, which has been another determinant in the county’s political shift. Even these white transplants, however, tend to be progressive. Unaffiliated voters are growing fast in Wake County, but about 2/3rds of these new voters lean Democratic. This can perhaps be attributed to the liberal culture of the high tech industry. To put it simply, the Research Triangle has become a magnet for liberals from all over the country, and it is the nature of RTP itself that has contributed to Wake’s growing liberalism – not the Northeastern origin of many of Wake’s transplants. The capital city of Raleigh is reliably Democratic, east Raleigh in particular has seen substantial demographic change; the minority population has exploded over the past decade. Downtown Raleigh and the majority white neighborhoods north of N.C. State continue to be the most liberal parts of the county, but those areas have not grown substantially. Instead, the greatest growth has been found in Raleigh’s sprawling suburbs. Towns like Cary, Apex, and Holly Springs have seen exponential growth over the past two decades. Where there were once cow pastures are now bustling residential neighborhoods filled with young families. Overall, these suburban areas tend to be more moderate, and voters such as these were heavily sought after during the 2012 election. These new transplant voters tend to be affluent, highly educated, and politically independent. They tend to vote with their pocketbooks and are scared off by social issues, especially abortion and gay rights. Wake County voted soundly against Amendment 1 last year, voters in highly educated, heavily transplant Western Wake were particularly opposed, with many Republicans voting against. Republicans here tend to be concerned about high taxes and are socially liberal compared to most other members of their party. In majority white areas lacking the transplant influence, Republicans are still strong. Areas untouched by transplants, however, are receding. As these regions of Wake County become more suburban, Democrats should gain. According to estimates, Romney won 60% of white voters in Wake County. In North Carolina as a whole, he won 68% of that population’s vote. This 60% number is in line with Romney’s nationwide performance with these voters. The bad news for Republicans is that in the most transplant-heavy areas of Wake County, whites only gave Romney about 55% of the vote. This seems to indicate that whites in Wake will continue to trend Democratic as new arrivals enter the electorate. Wake County has been booming in population since the 1970s, but these transplants did not substantially alter Wake’s political makeup until much later – and if anything, they aided the Republican Party. Affluent and highly educated, rural Democrats did not appeal to them and they often opted for Republican candidates at both the state and federal level. The one exception to this was Jesse Helms, who offended their more moderate sensibilities. As time went on, however, the Republican Party became less like Gerald Ford and more like Jesse Helms. The increased social conservatism of the Republican Party appealed to Southerners and native North Carolinians, but hurt them with more moderate voters, especially those from the northeast. Thus, not only has Wake seen an influx of liberals – the conservatism of the Republican Party has alienated those moderates who might otherwise lend their support. Pat McCrory carried Wake County in 2012, but he performed atypically well with moderates. Days of Republicans winning countywide in Wake are probably numbered. Richard Burr also narrowly won the county in 2010 in a perfect year for Republicans. An increased Democratic trend will probably prove fatal to Republican chances here except in extraordinary scenarios. Republicans maintain control of the County Commission, most of the Republican seats are up for reelection in 2014. The Board of Education is currently under Democratic control, but this is threatened by legislation that will redistrict the board and make it easier for Republicans to win a majority. Republicans also hold a majority of the State Senate and State House delegation. These Republicans represent suburban districts and could be in peril if there is a backlash against the General Assembly from voters. Growth and Demographic Changes – The growth rate from 2000 to 2010 was 43.51%, which is massive. Whites grew by 31.46%, blacks grew by 50.63%. This gap has helped contribute to a Democratic trend in the county. Asians represent 5.39% of the population, Indians are abundant in Morrisville and parts of western Cary. Hispanics are now 10% of the populace but many are unregistered and many of those do not vote. Massive registration of Hispanics on the part of the Democratic Party would help turn Wake into a solid Democratic county. Forecast: As the county with the largest number of voters, Republicans must perform strong in Wake to win statewide. The Republican nominee for U.S. Senate will probably need at least 42% of the vote here to have a chance at winning statewide. There are a number of moderates who could be persuaded to vote Republican if the party shifts to the center. But the future in Wake looks bleak for Republicans for one reason: growth. Growth in Wake County is highly correlated with increased support for Democratic candidates. Unless this growth is contained, Wake County and the entire Research Triangle is bound to become another Northern Virginia – a highly affluent, moderate to liberal area that is able to dominate an otherwise conservative red state.